If you had a paint brush, pallet and enough time, you probably couldn’t paint a picture more pristine than the beaches of Mauritius. 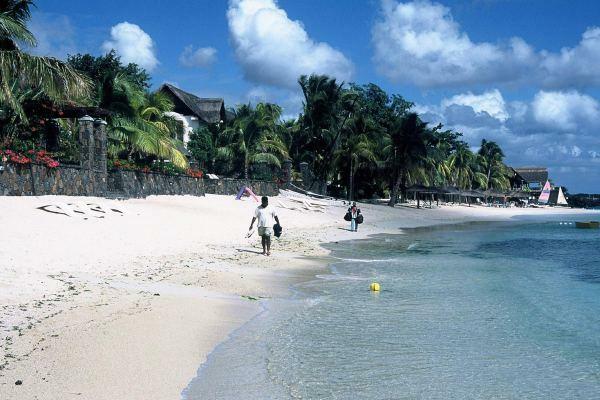 And often we get ask what are our favorite beaches in this area of the globe – undoubtedly there are many world class beaches from Zanzibar on out to the islands of Mauritius. And the people who arrived here first – maybe they imagined the rest of the ocean held such treasures? It makes it hard to think about work when you see those lazy palms and that brilliant white sand. Can we simply lay out in the sun for a bit? With Mont Choisy close by, Grand Baie is a small peninsula on the northeast coast of the island. Just like the once sleepy town of Buzios, near Rio in Brazil, Grand Baie was a fisherman’s village not too long ago. And they were the ones that enjoyed the beautiful beaches you’ll find here. I love contrasts, and Mauritius doesn’t let you down. You have the brilliant white sand of the beaches and the just gorgeous emerald waters of the ocean. Drop in a few lovely coconut trees and this just might be paradise. But it wasn’t always that way, here. Grand Baie was almost left without hope of development. 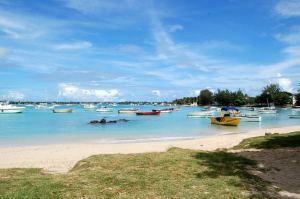 The wise people of the Mauritian government changed all that and now Grand Baie is the jewel of the island. Just about everything is here. Boutique shops and sales of local crafts make this an ideal place to come learn about Mauritian culture. But that’s not all. Development has included many hotels and resorts which range from elite to bungalows with kitchenettes. They’ve included a marina complete with water sports, and with the Black River Gorges National Park near by, you will have plenty to do if all you do is spend your vacation on this part of Mauritius. Grand Baie still has fishing boats so when you visit the beach here, remember that you’ll be sharing it with them. 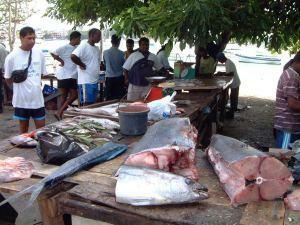 Other beaches we’ve reviewed, Pereybere, Mont Choisy and Trou aux Biches do not have all the fishing boats. But the beach and water is simply breathtaking here. Shade is close by with the tall Casuarina trees which line almost the entire coastline. This beach will probably have fewer people in it because of the fishing boat situation. If that doesn’t bother you, you’re in for a wonderful day at the beach. Sunset Boulevard comes into Grand Baie Beach and here you will find a few apartments and local eateries where you can hang out. It’s a real photo opportunity as the palms sway in the breeze and you can normally catch a small fishing boat in the view. Down toward the opposite end of the beach is a real fish market and at the right time of day you’ll see fishermen bringing in their catch. Grand Baie Beach is spectacular and has everything close to make coming here and enjoyable experience. The sand is soft, the water warm with light waves. The beach slopes gently so even small children can enjoy the water near shore. And if you get adventurous, you can walk quite a ways towards other nearby beaches. Take a camera and some water and you’re good for an experience you’ll never forget. Final thought: It was here that in November of 1810 the British invaded Mauritius, called the Invasion of Ile de France.